My boy is well.... a boy! He's growing and becoming ornery. He loves to make motor noises while driving (and eating) cars. I was totally in love with him crawling and playing under the table. I often give thanks for this healthy sweet baby. He is cuddle-icious and is doted on by everyone who sees him. Just a boy and his cars. 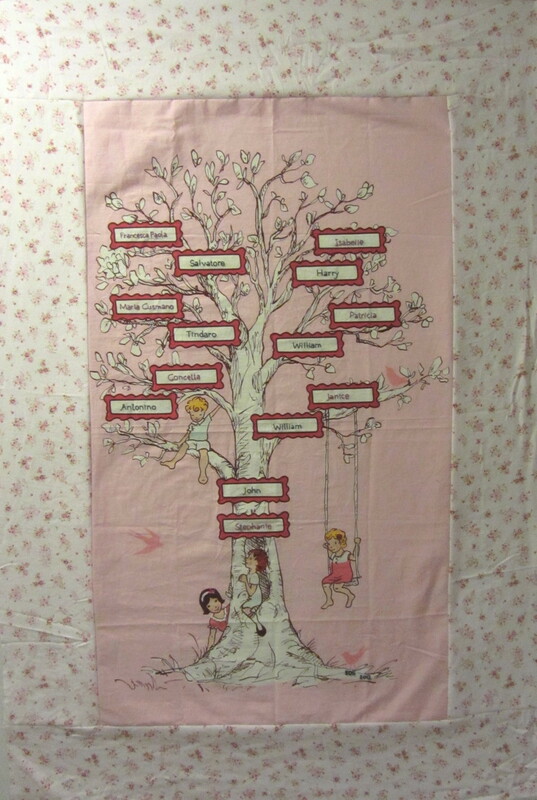 Working on my sarah jane family tree quilt. We recently drove really, really far to visit my family and I thought it fitting to work on this quilt. I'm kicking myself for not picking up any of the other adorable fabric in her line but I think I'll have enough pinks to work with. The 6-inch border here is from a flannel sheet. It is so warm and fuzzy. 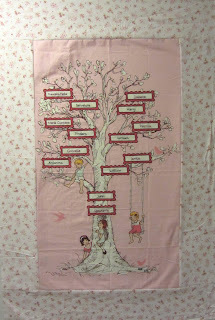 For the embroidery, I used plum thread (3 ply) on the female names and dark brown for the males. It turned out perfectly! Hopefully it will be finished up before long.